PuppyCube is an ultra-short throw projector with a built-in camera to detect touch gestures, from a company called Puppy Robot. 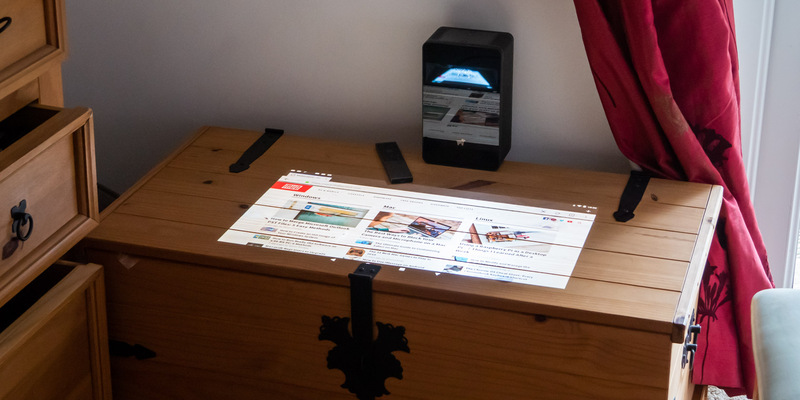 It turns any surface into a 23″ touchscreen; and when flipped on its back, acts as a regular projector too. Having recently finished crowdfunding, it’ll be shipping shortly on Amazon for a cool $ 1000 price tag. We’ve got our hands on one of the final devices, so read on to find out what we thought of it. At the end of this review, we’ll be giving our test unit to one lucky reader, so keep reading to find out how to win it! However, regardless of how technically impressive that is, I’m not sure I could think of a use-case for it. If your child is kept in a cupboard under the stairs, like Harry Potter, I suppose they could at least enjoy a big screen TV experience. At 720p and 300 lumens, it won’t replace even a budget-friendly $ 300 home cinema projector. Consider the wall projection a bonus, rather than a main feature of the PuppyCube. Other app experiences weren’t ideal, either. Plex is my preferred video client. In projector mode, using the included remote control, it worked fine and videos played smoothly. In tabletop mode, it got stuck in a loop of insisting I switch to mobile mode because I had a touch interface, while the Puppy OS seemed to force it into TV mode. Conversely, BBC iPlayer worked fine in tabletop mode, but was useless when projected onto the wall due to the lack of pointer. The remote control didn’t allow me to actually select anything; I could only scroll up and down. On other Android TV-like interfaces, the remote controls have had a pointer mode precisely for cases like this. Yes, these issues are all software specific and not really the fault of PuppyCube, but they’re infuriating none the less and not something I’ve faced on other systems.